As you record this information, more detail is surfaced for you within the invoice or transaction such as $/kg, per head and total live or carcass weight. If you're not sure what weight you should put into the invoice or transaction i.e. you've purchased some store lambs and don't have an actual weight, we recommend putting an estimate weight in. This will help to keep the information in future production reports consistent. Entering weights into invoices and transactions. Entering weights into a plan. while for sales, you can select either live or carcass. The default weight measure for each stock code is customised within each code. For example, 1yr bulls default to live while sale lambs default to carcass. A default yield percentage has also been set within each code so that carcass weight can be calculated from live weight and vice versa in production reports. if you want to change the default measure or yield in a code, you can change this within the code setting. What happens if you don't record a weight? A message will appear under the coded line, advising you to enter a weight. 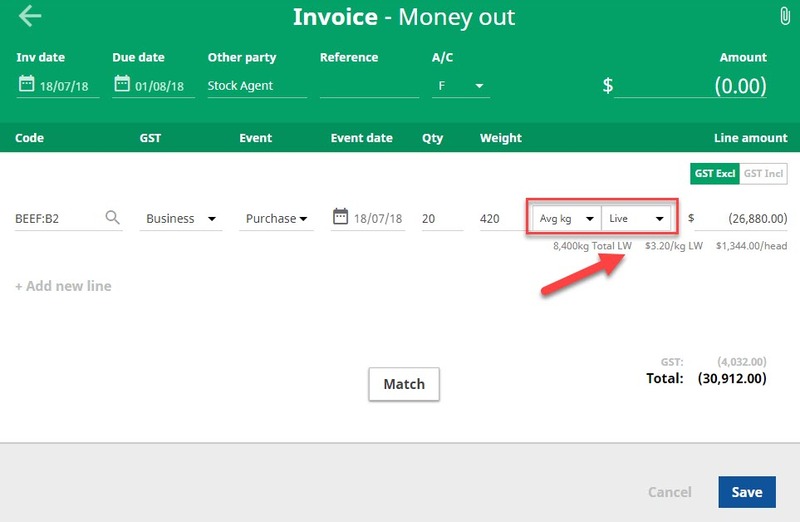 Once you have included the weight, you can save and exit the invoice, transaction or plan worksheet.